"The Hustler isn't what he used to be. But he has the next best thing. A kid who is." Eddie Felson is a pool hustler who finds a young guy named Vincent in a pool hall. Eddie sees a lot of himself in Vincent and offers to teach Vincent how to be a pool shark. Vincent initially hesitates but eventually accepts Eddie’s offer. Eddie takes him and Vincent’s girlfriend, Carmen, on a road trip across the country. Along the way Vincent shows Eddie how to hustle other players. However, Eddie didn't plan on Vincent being cocky, and he confronts Vincent after he begins to show off his talent to others players, causing Eddie to lose money on games. Eddie decides to pick up his cue again and starts playing pool with other players, working on his hustle. When he is beaten by another pool shark, Eddie is embarrassed that he did not realize he was being hustled. Eddie deserts Vincent and Carmen, telling them he can no longer show them the ropes. Eddie gives them enough money to play in a championship pool tournament in Atlantic City before he leaves. A few months later, a new and improved Eddie returns to the professional pool circuit and ends up at the Atlantic City tournament. Eddie is surprised to run into Vincent and Carmen and realizes Vincent has improved his pool game. They end up playing a match against each other where Eddie beats Vincent. As a result of his win, Eddie thinks he is back on top of his game. Vincent and Carmen stop by Eddie’s hotel room and give him a lot of cash. Confused, Eddie asks them what the money is for. They explain it is Eddie’s “share” of a bet that Vincent made on their own match and that Vincent lost the match on purpose. Eddie is not amused by Vincent’s scam, and he challenges Vincent to a straight game of pool. 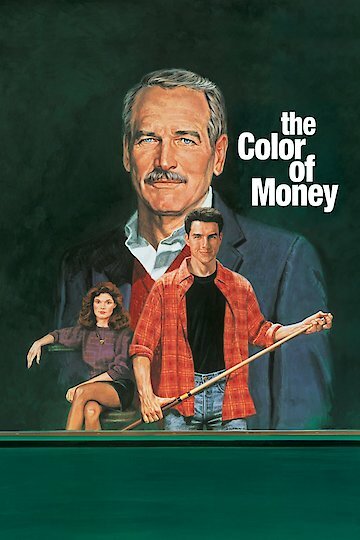 The Color of Money is currently available to watch and stream, buy on demand at Amazon, Vudu, Google Play, iTunes, YouTube VOD online.